The New York & New Jersey region has a transformational opportunity to improve airport access, and better connect Newark’s South Ward to transit, by extending PATH, New York’s ‘second subway’, to Newark Liberty International Airport. The Port Authority of New York & New Jersey, which operates PATH, is currently in the advanced planning stages of the PATH Extension Project, and is seeking public input as the project moves forward. Here are three ways it would benefit the region. New York has fallen behind its peer cities in a critical area: fast, efficient, and direct rail connections to airports. LaGuardia Airport is served only by bus, and a potential extension of the New York City Subway from nearby Astoria, Queens is still just an idea, despite years of discussion. John F. Kennedy International Airport is served by the Subway and Long Island Railroad, but both services require travelers to connect to the JFK AirTrain at stations several miles away from the airport’s terminals. Stephen Sigmund, executive director of the Global Gateway Alliance, says the prospect of multiple transfers drives people away from taking transit. In London, the Tube’s Piccadilly Line provides subway service to all terminals at Heathrow Airport, while Heathrow Express and Heathrow Connect provide service via regional rail at varying price points and travel times. London City Airport is served by the Docklands Light Rail, which connects to multiple Tube lines. Both of Chicago’s airports have direct subway access: The Chicago Transit Authority’s Blue Line provides direct service to O’Hare International Airport and the Red Line provides direct service to Midway Airport. PATH provides 24/7 subway service between New York & New Jersey, connecting Midtown and Downtown Manhattan with Hoboken, Jersey City, Harrison, and Newark. It serves as the transit backbone for dense urban areas supporting more than 400,000 jobs within a 1/2 mile of PATH stations, and a residential population of more than 8.2 million people, projected to grow to 9.6 million by 2040. 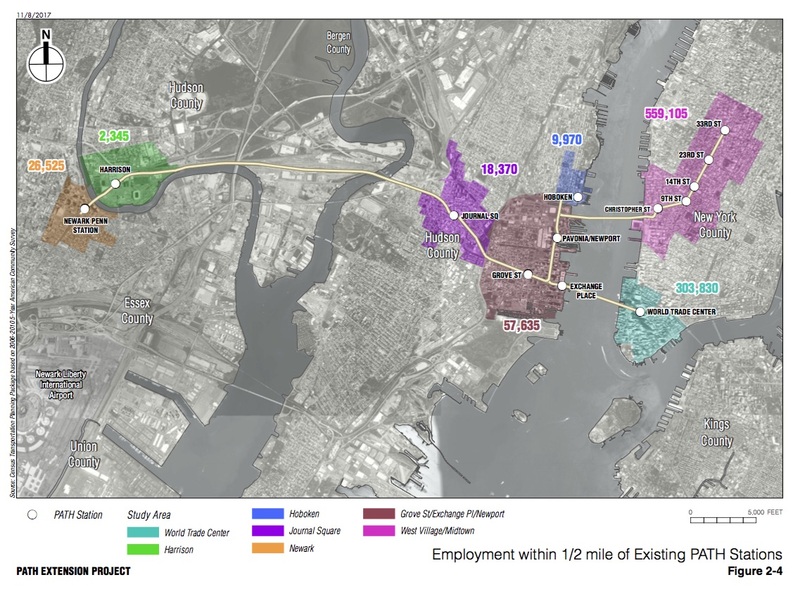 More than 400,000 jobs are within a 1/2 mile of existing PATH stations. PATH service currently terminates at Newark Penn Station, roughly two miles north of Newark Airport. In order to reach the airport, PATH riders have to transfer at Newark Penn Station to a train or bus operated by New Jersey Transit, or an Amtrak intercity train. The PATH extension scoping document (PDF) highlights the limitations of the transfer at Newark Penn Station, which is especially challenging when traveling with luggage. The connection between PATH and NJ TRANSIT at Newark Penn Station for those traveling in the outbound direction, involves transferring to another platform via stairs, elevators, or escalators. This transfer is inconvenient and platforms, corridors and vertical circulation elements are often crowded during peak periods. Pedestrian modeling shows that by 2030 all vertical circulation elements in Newark Penn Station will be congested, in some cases severely congested, without significant infrastructure investment. Once a person has navigated the transfer at Newark Penn Station, they may face a long wait for the next New Jersey Transit train, especially on weekends or off-peak hours. New Jersey Transit also runs two bus lines connecting downtown Newark with the airport, but the Go 28 bus rapid transit doesn’t stop at Newark Penn Station, so riders would have to walk or take Newark Light Rail to Broad St. Station, easily adding 15-20 minutes to the trip. The 62 local bus takes a scheduled 16 minutes to travel between Newark Penn Station and the airport, but the bus travels in mixed-traffic, and is subject to delays depending on traffic conditions. 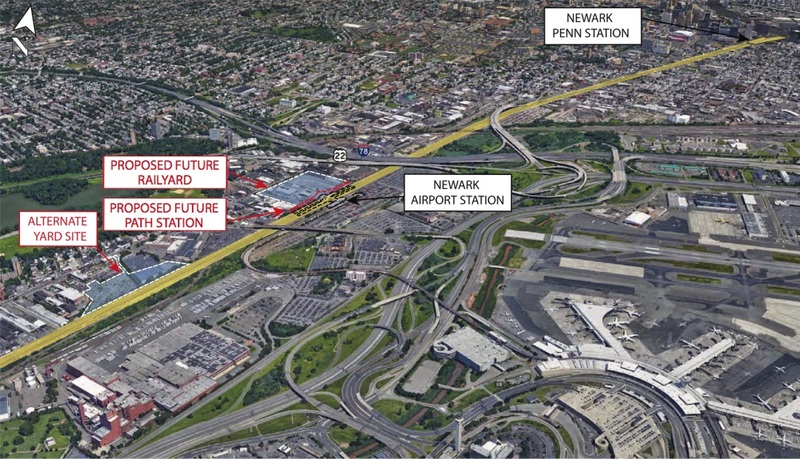 Extending PATH to Newark Airport would eliminate the transfers, waiting time, and unpredictability associated with the current transit options, and provide a one-seat ride directly to the Newark Airport station, where the AirTrain monorail connects to individual terminals. According to the PATH extension scoping document (PDF), PATH service to Newark Airport would operate every three minutes during peak hours. This would represent a significant improvement over the current New Jersey Transit service, which operates approximately every ten minutes during peak hours. Off-peak and overnight service would improve as well. PATH’s current schedule (PDF) shows off-peak service between World Trade Center and Newark operating approximately every 10-15 minutes, and every 35 minutes between midnight and 5am. Off-peak service to Newark Airport could conceivably operate on this same schedule, if not more frequently, since PATH is nearing completion of a major upgrade to its signal system. The current New Jersey Transit rail service does not operate from 2am-5am, and the 28 Go bus does not operate from 2-4:30am, leaving only the local 62 bus serving the airport during overnight hours. PATH is one of only five subway systems in the US to operate 24/7, and Newark Airport is a 24/7 operation, with 80 arriving and 78 departing flights between midnight and 6am. Extending PATH to Newark Airport would connect two 24/7 transportation services operated by the same agency, which would allow for reliable, convenient, well-coordinated transit service for the growing population in New York & New Jersey who need round-the-clock access for travel and work. The region faces a major potential for disruption in the coming years, if the century-old North River Tunnels, which were damaged by Superstorm Sandy, need to be closed for emergency repairs. In 2015, then-Amtrak CEO Joseph Boardman told NPR that a tunnel closure would reduce transit capacity by 75%. Right now, Boardman says, Amtrak can squeeze 24 trains an hour through the two tracks of the tunnel. But when one of them has to close for repairs, that number drops to just six trains per hour. Closure of one of the rail tunnels connecting to Penn Station could create widespread chaos in the transit network, and New Jersey State Senator Bob Gordon sees the PATH Newark extension as an important alternative to strengthen trans-Hudson transit. He told NJTV’s Briana Vannozzi that the uncertainty in timing and funding surrounding the Gateway project to build additional tunnels for Amtrak and New Jersey Transit makes the PATH extension a viable ‘Plan B’ to increase the reliability of the region’s transit network. Shahram Tahmasseby and Rob van Nes, authors of Improving Service Reliability in Urban Transport Networks, demonstrate that increasing redundancy helps counteract the forces that affect transit service reliability, including varying demand, equipment breakdowns, and necessary maintenance. Increasing line density in a certain way results in higher redundancy in the service network and consequently can improve service reliability. Furthermore, the availability of several line options enables travellers to switch between transit lines in case of disturbances and find an alternative route for making their trip. Multiple national, state, county, and local roads including Interstates 78 & 95, U.S. Routes 1 & 9, NJ Route 81, Earhardt Drive, and Brewster Road provide redundancy for those accessing the airport by road. Extending PATH would similarly diversify and enhance transit connections to the airport. The PATH Newark Extension is being planned not just as an airport extension, but an economic anchor for Newark’s South Ward, and a transit catchment that would relieve strain on other trans-hudson crossings. The PATH extension would bring a new subway station within two blocks of Newark’s Dayton Neighborhood, offering a direct transit connection to downtown Newark, Jersey City, and Manhattan. Proposed Newark Airport PATH station and train yard locations. PATH, infrastructure firm HNTB, and the Regional Plan Association studied how new PATH service, combined with the revitalization plan for Newark’s Dayton neighborhood (PDF) could lay the groundwork for new mixed-use development on the formerly industrial area adjacent to the proposed extension. 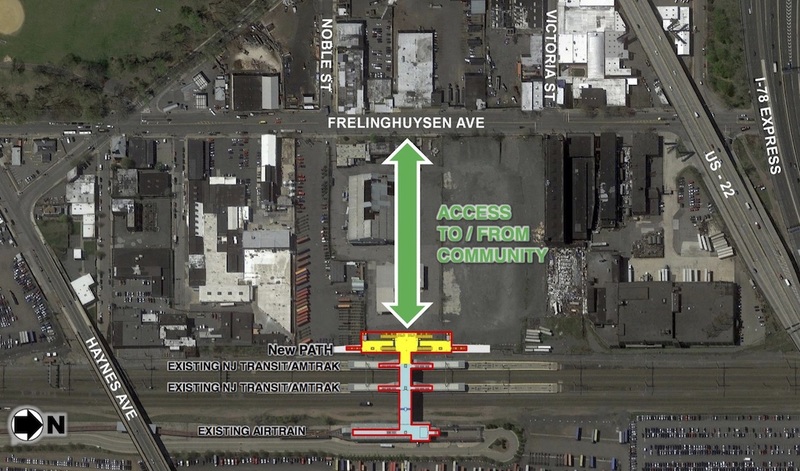 According to the PATH extension scoping document (PDF), the new station would more strongly connect the existing neighborhood to transit, provide greater access to job opportunities throughout the region, and anchor new transit-oriented development. The Dayton neighborhood contains over a hundred acres of vacant or underutilized industrial properties adjacent to its residential core. The Newark 2012 Master Plan noted that improved transit accessibility at the Airport Station could create transit-oriented development opportunities, such as office space for airport logistics, and hospitality uses (hotels and hotel support businesses), as well as residential development, which could serve a broad market, including airport workers and crew members who would benefit from proximity to the airport. Strategies identified in the Newark 2012 Master Plan to support new transit-oriented development and provide better transit access in Newark include: extending PATH service to the Airport Station; providing a new multi-modal station that is accessible to the community; and construction of a commuter parking facility. Critics often argue that transit extensions to airports prioritize business travelers and tourists over local populations, but PATH’s plan is a forward-thinking approach that could make the extension into a success story for transit and community growth. The new PATH Newark Airport Station would also reconnect Newark’s South Ward to rapid transit.